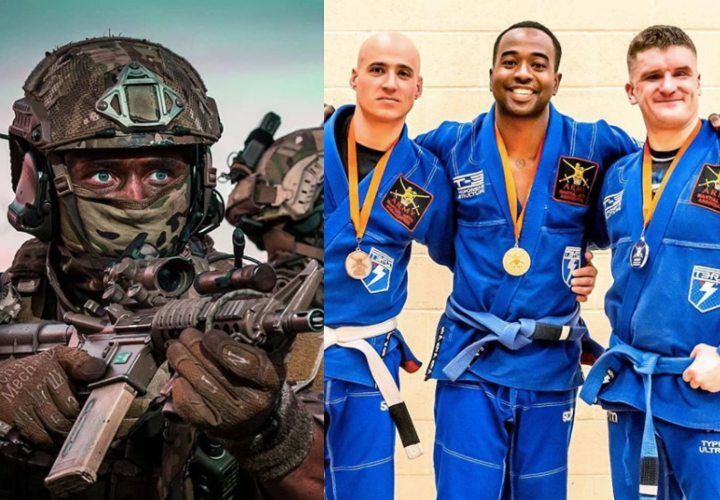 The ascendance of Jiu-Jitsu within the British Army has been nothing short of meteoric. Within the space of 4 years Jiu-Jitsu has transitioned in the British Army from an unrecognised obscure activity, practiced by a few on some old tired mats, to the biggest Martial Art in the Army and across Defence. The sport has become so large, so quickly that it now has more practitioners than the rest of all the Martial Arts in Defence combined. 2016 proved to be an absolute breakthrough year. The Army Championships attendance grew from a handful to over 50 competitors and from that a team of 7 was selected to compete at the IBJJF European Championships, winning 1x Gold, 1x Silver and 2x Bronze medals. The momentum continued with the Army winning the Inter-Services Championships, beating the Royal Marines and the RAF in an ultra-competitive event. The Army’s Head Coach, Andrew Roberts, a 2nd degree black belt under Roger Gracie, put the team in contact with Dean Thompson, CEO of Storm Kimonos, who threw the weight of his globally recognised brand behind the Team in their preparation for the 2016 IBJJF World Masters in Las Vegas. Dean took the Army Team under his wing and as soon as they arrived in California, he hooked them up with Storm Superstar athlete Romulo Barral to help prepare for their biggest test to date. Even more impressive was the bespoke and iconic Army Gis that Dean and the Storm team created, which gave the team an instantly recognisable brand. The trip to Las Vegas opened the Army’s eyes to the exceptional competition standard and although they were lucky enough to leave with 1x Gold, they knew they needed to up their game. 2019 will mark the 2nd time that the Army Team have competed in Las Vegas and they are coming off another respectable performance at the IBJJF European Championships, again winning 1x Gold, 1x Silver and 2x Bronze medals. They will deploy, as always, extremely well supported by the Storm Team and bolstered by the assistance from the UK Jiu-Jitsu Community, who have absolutely embraced them and supported them extensively. None more so than Mauricio Gomes and Roger Gracie, who look after military personnel and Veterans from all over the country and spend a considerable amount of time mentoring and helping to develop the team. But the Army Teams most significant contribution is the way in which they have given back to the Veteran Community. Several members of the team run regular training sessions for Armed forces Charities such as Help for Heroes and Combat Stress. This has introduced many veterans, who have suffered the effects or life altering injuries or PTSD, to the therapeutic benefits of Jiu-Jitsu, which in not too bold of a statement is more effective than medicine in promoting mental health and wellbeing. Some of our Veterans enjoy a recreation roll, but others have become absolute mat savages. None more so than Rob Long, who was blinded by an improvised explosive device in Helmand Province, Afghanistan. Under the guidance of Mauricio Gomes, Roger Gracie and Andy Roberts, Rob went from a raw novice that had never grappled in his life to winning Gold at the Para World Cup in Abu Dhabi. If that wasn’t enough he then went on to be nominated for the Sun Newspaper Military Awards, winning the category for Overcoming Adversity. All this from a sport in the Army that is not even 4 yrs old. So the message is pretty clear…… If you love Jiu-Jitsu, want to compete all over the world (and at Army events with over 100+ competitors) and be sponsored by the best brand in the business (Storm Kimonos) and have the opportunity to give back to our Veteran Community, then you just need to ‘be the best’ and join the Army.